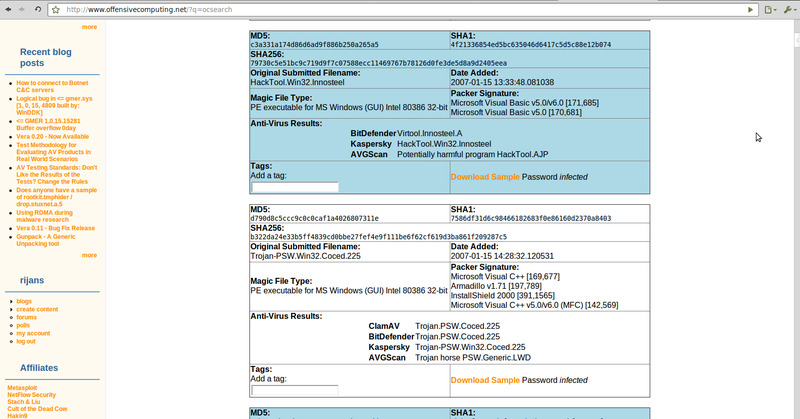 Malware Authors: Malware authors are the main baby of all virus , trojan, worm world. They are the first creator of viruses. 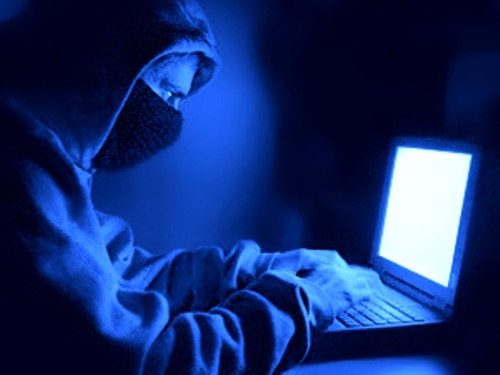 Hackers : Hackers are the number one persons whose are mostly interact with virus. 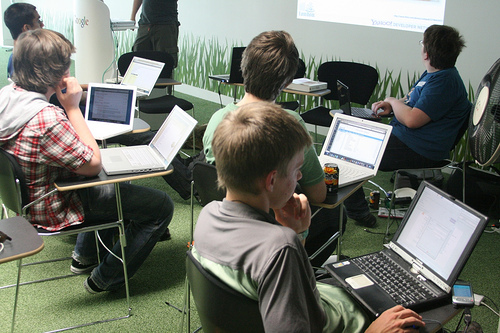 They are engaged in making hack tools, spyware, rootkits to accomplish their hacking and cracking activities. AntiVirus and Security Tool Owners : All antivirus and security software owners must need virus samples. Because all anti-virus, anti-spyware etc work with own malware database. Malware or virus databases are application database where malware definitions and identities are recorded. A virus sample is needed to make its definition. 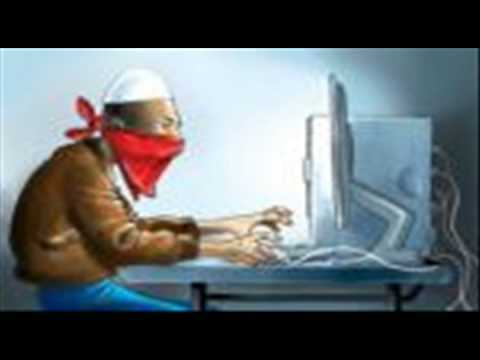 Ethical Hackers : Ethical hackers are actually white hat hackers those research and works for cyber security. Generally these hackers work in individual company and try to make their company’s computer and online systems more secured so that other black hat hackers will not able to hack their company’s system. Virus Lovers : Virus lovers are not VIP person as above. These persons are actually very curious about computer viruses. They try to know how they work. Some of them become expert about viruses by researching with them. So they acquire enough knowledge and experience to protect themselves from virus. Computer and Technology Students : Computer students from any computer and technology related subject need virus sample to experiment with them. Others : Other persons my indicate computer teachers, IT consultants, IT Journalists, Bloggers etc also computer virus sample. Now you understood why virus samples are useful. But you should care about viruses even if you don’t have above causes. 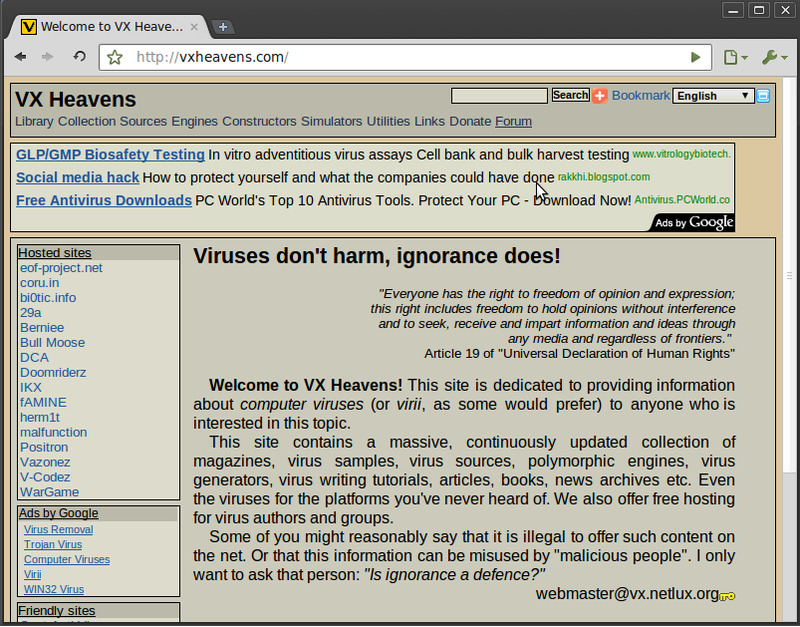 There is a quotation by the author of www.vxheaven.com is “Viruses don’t harm, Ignorance does!” This means that viruses cannot harm you if you know about them. But if you always ignore them, you will have little knowledge about them. So they will able infect your system! 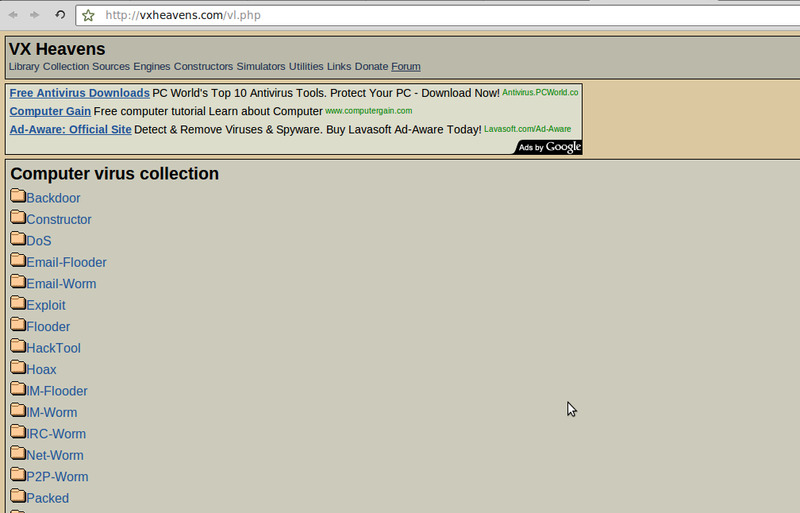 1. vxheavens.com: vxheaven.com (vx.netlux.org) is the most popular virus download website on the world. They have the best and biggest collections of all types of viruses for all computer and cell phone operating systems. 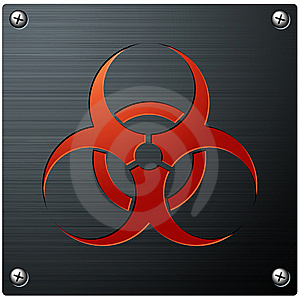 Free virus collection for download. All viruses are categorized with their types such as Trojans, spyware, Worms, Rootkits, Hoaxes, Hack Tools, Backdoors, Exploits etc. All viruses are divided with their OS(Operating System) support such as Microsoft Windows(XP, VIsta, 7), DOS, Apple Mac OS X, Linux(Ubuntu, Fedora etc), Java(J2ME, J2SE etc), HTML, BSD, Mobile OS(Symbian, WinCE, Windows Mobile, Android, Palm, iOS, iPhone, Blacberry etc. Virus serving and protecting utilities. Virus creating utilities and generator. Virus news updates and blogs, articles, books etc. Virus sources and polymorphic engines. Detailed information about every virus. 2.offensivecomputing.net :Offensivecomputing.net is another virus serving and blogging site. This site is intended to provide discussion environment by blog and virus samples so that people can share information about viruses. The viruses here are not uploaded by the owner of the site. All viruses are uploads by general people. Any one can upload virus here with simple uploader. Registered users can search and download viruses in zip package. Viruses are protected with the password “infected“. So extract the virus executable(exe, msi, pif, bat etc) files from zip package using the password infected. With free blog, users can share any information or request withe other people. With automatic online antivirus scanner, users can see the alias name of a virus. 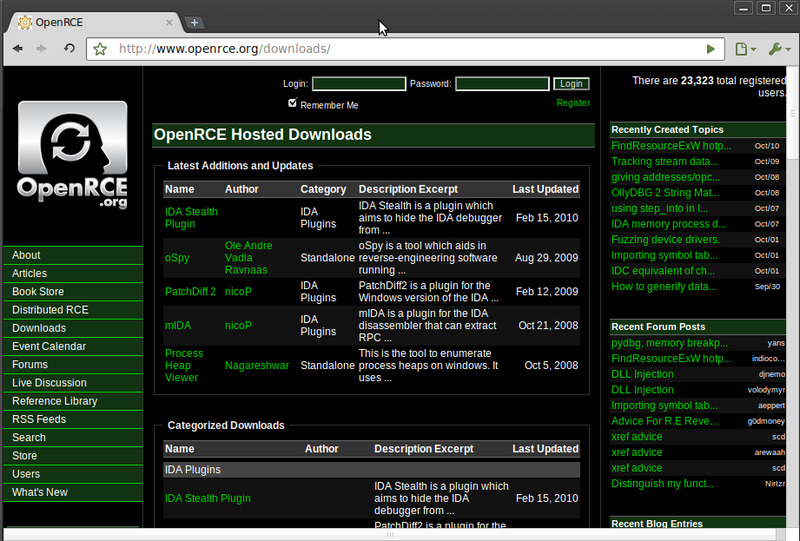 3. openrce.org : Openrce.org is a site of open source viruses. Here you can get various types of viruses, rootkits, hackingtools with their source code. 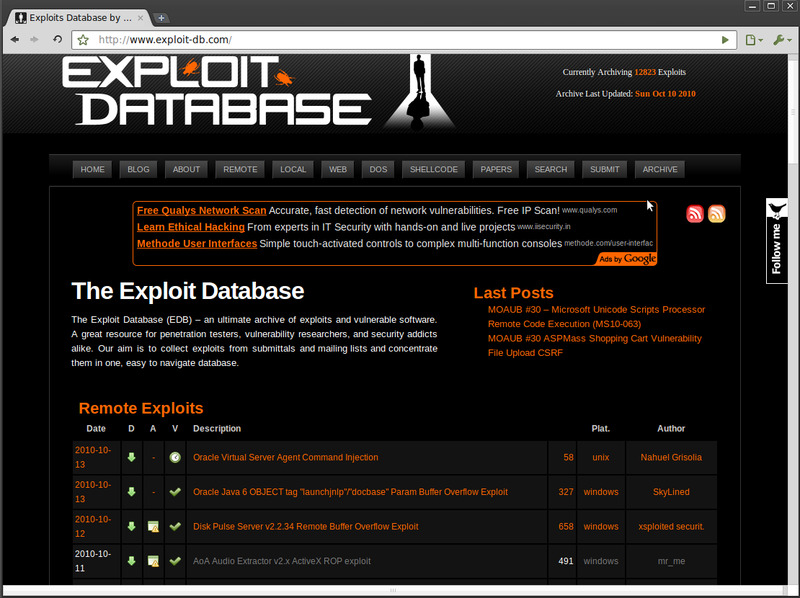 4. exploit-db.com : Exploit-db.com is a site of hackers where hackers and computer vulnerability researchers share there exploit tools and make discussion on them. Here you can get exploits for Linux, Windows, Mac OS X, ASP, PHP, BSD etc. 5. inj3ct0r.com : Inj3ct0r.com is the site of expert exploit hackers from where you can get many hacking exploits for windows, MAC OS X, Perl, PHP, Win32 etc. There are many other sites for open virus collection. You can inform me if you know more sites. Warning: TechGainer.com is not responsible for any damage of your system caused by virus resources from here. You make a great point. Got some great information here. I think that if more folks thought about it that way, theyd have a better time get the hang ofing the issue. Your view is definitely something Id like to see more of. appreciate for this website. Its fantastic and so is what youve got to say. Just like the other dude pointed out. KILL the spammage! Irresponsible article, the real hackers doesn’t crack and make viruses, the real hackers just code for good. Please don’t be stupid, the only morons that make viruses are crackers, virus creators, and other stupid people. Please read this article from Eric Steven Raymond: http://www.catb.org/esr/faqs/hacker-howto.html#what_is and correct your article, don’t be one more of the fear-mongers around the periodistic world, the world is enough with all that fear-mongering garbage. I’m very very far to become a hacker, but I respect them because thanks to them we have Linux, Linux distributions like Ubuntu, Fedora, Opensuse, Debian, and a very extensive collection of free/libre software… They’re hackers, because they spent much of their time to make great software. I agree what you said! But the “hacker” word I used here is from the perspective of mainstream people!